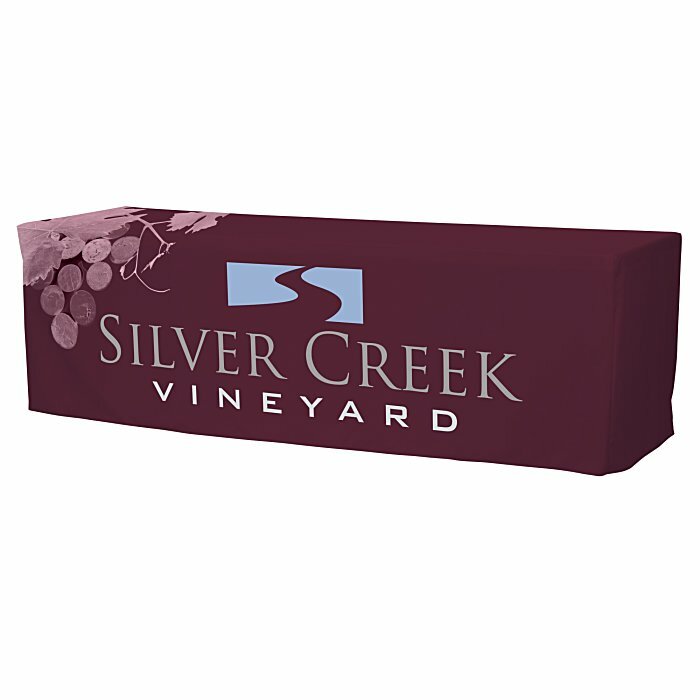 Outdoor events are a walk in the park with weather-friendly custom table covers! Make it easier for customers to locate your booth with full-color fitted table covers. The outdoor-safe, heavy-duty table throws take on wet weather and spills with ease. The printed table throws are designed with fitted corners on all four sides of your 8' table, giving your display a professional look while hiding your set-up materials underneath. Flame-retardant rating offers peace of mind and assurance of safety. Provides a finished look for your next trade show, convention, job fair, demonstration, presentation and more! Your design covers the entire table throw so your company logo is all they see! For the 6-foot version, please see item #139924-6Closed-Back Outdoor Fitted Table Cover - 6'. To add an optional carrying case, please see item #152703Square Soft Carrying Case. Size: 29" x 96" x 30". Your price includes a full color imprint on the entire table cover.